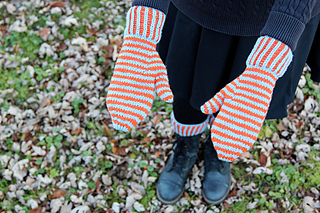 The Funkasonic Mittens were designed alongside their sister pattern, the Funkasonic Mukluks. Both are intended to be fun, fresh and colorful, but also to challenge knitters to try new techniques and be brave with color. The Funkasonic Mittens are a little easier than their sister pattern, which makes them a great place to start if you’re knitting both. 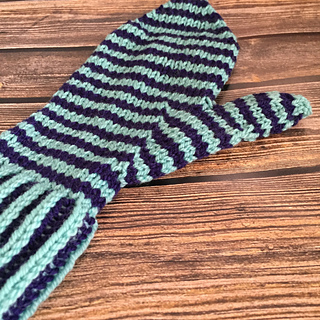 The stripes across the body of the mittens are achieved by carrying the non-working yarn up the side of the mittens where the round begins. The resultant rows of color are hypnotizing to behold and really fun to wear! Read more about Funkasonic Mittens here. You can use double pointed or circular needles, depending on your preference. 22 sts and 30 rows = 4 inches 10 cm after wet blocking, knit in stockinette stitch on US size 4 needles. Note: This pattern was only available via PostStitch between December 15 and January 15, 2016. As of January 15, 2016, it has been made available for purchase as a Ravelry download.